Marty McFly and Doc Brown are back together again! With Back to the Future celebrating its 30th anniversary, actors Michael J. Fox and Christopher Lloyd have reunited for a Toyota commercial that directly addresses the film's vision of the future. This year is a particularly significant anniversary for Back to the Future: not only is 2015 the 30th anniversary of the original 1985 film, but it's also the year that the time-travelling characters visited in the 1989 sequel Back to the Future Part II. In that film, McFly helped his kids by travelling to October 21, 2015. 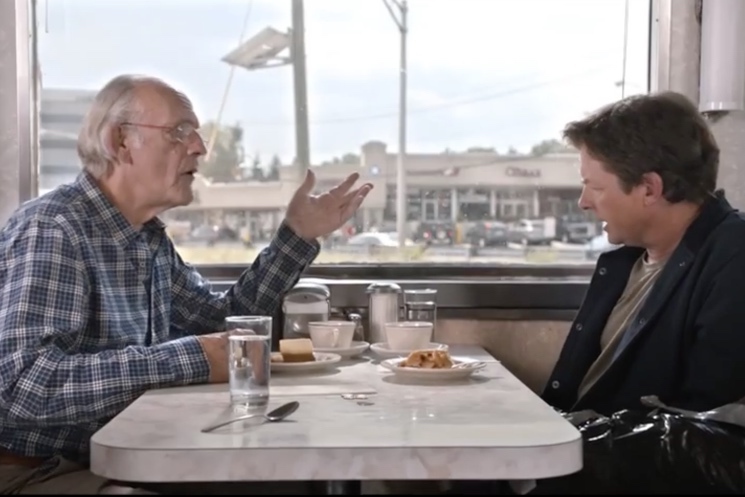 In this new Toyota ad, Fox and Lloyd sit down at a diner and discuss the film's vision of the future, addressing which predictions have come true and which ones didn't. As they bicker about fax machines, the whole thing seems more like an episode of Seinfeld than Back to the Future. Watch a 43-second preview of Fox and Lloyd's meeting below. The full spot will be unveiled on October 21, which is being dubbed "Back to the Future Day." Of course, there's a certain irony in Marty and Doc reuniting for Toyota, given that Back to the Future is so closely associated with the DeLorean, a car made by the Detroit's long-defunct Delorean Motor Company. Lloyd told The Hollywood Reporter that he would be willing to reprise his role as Doc Brown if the entire cast and crew were to reunite for a fourth Back to the Future film. He also pointed out that, in Back to the Future Part II, the Chicago Cubs were showed winning the World Series. With the long-struggling baseball team having recently qualified for the National League Championship Series, the real-life Cubbies now have a one-in-four shot of winning the World Series. The team hasn't won the World Series since 1908, so this would be an impressive prediction indeed.